Though by no means as ethnically diverse as neighbouring Laos or Viet Nam, Cambodia is home to some 20 culturally distinct hill tribes, which reside mainly in the remote mountainous districts of the north east. Figures on the ethnic make-up of Cambodian society are somewhat difficult to determine, and the most recent population census in 1998 did not address the question of ethnicity. However it is thought that ethnic Khmers - drawn from the Eastern Mon-Khmer group of the Mon-Khmer language family - make up around 96 per cent of Cambodia's total population. Ethnic Khmers living just outside the kingdom in An Giang, B?c Liêu, Kiên Giang, Sóc Trang and Trà Vinh Provinces of southern Vi?t Nam (an area known in Cambodia as Kampuchea Krom or Lower Cambodia which was ceded to the Vi?t kingdom in 1749) maintain their own distinct cultural identity. The largest single minority group in Cambodia is that of the Cham-Malays - drawn from the Chamic branch of the Austronesian or Malay-Polynesian language group of the Austro-Thai language family - who are settled mainly along the Mekong River to the north of Phnom Penh. Descended from the inhabitants of the ancient kingdom of Champa in what is now south-central coastal Vi?t Nam, they adopted their faith and script from the Malays, who settled in Kampot at the invitation of Muslim Khmer King Chan in 1642. Consequently their language and script differs somewhat from that of their cousins in Vi?t Nam. Partly urbanised, often educated and much involved in trade and commerce, the Cham were severely persecuted during the Pol Pot years and their present population of 220,000 (1992) compares to a figure of over 800,000 during the 1950s and 1960s. Numbering around 50,000, the ethnic Chinese - drawn from the Han (Sinitic) language group of the Sino-Tibetan language family - constitute another important ethnic group in Cambodia, although as in neighbouring Thailand, they have been assimilated to a greater degree than in many other parts of South East Asia. Over the past few years there has arguably been a fresh wave of siniticisation as ethnic Chinese business people from Taiwan, Malaysia and Singapore have invested in Cambodia and the Chinese government has provided important bilateral aid. Chinese language schools are popular and there are now several local Chinese-language newspapers in Phnom Penh. Major Chinese festivals such as Chinese New Year and the Harvest Moon Festival are widely observed. Although they are not official holidays, market traders and stallholders close shop in such large numbers that in the centre of Phnom Penh, business activity almost comes to a halt. A community of some 95,000 ethnic Vietnamese (Viet-Muong branch, Mon-Khmer language group, Austro-Asiatic language family) is dominant in Cambodia’s fisheries and manual trades. Cambodia is also home to numerous hill tribe peoples, collectively referred to by the government as Khmer Loeu (‘Highland Khmer’), a name coined in the 1960s by Prince Norodom Sihanouk to help generate a feeling of unity between the highlanders and the lowland ethnic Khmer majority. The most numerically significant of these hill tribes are the Pnong (or Mnong, 19,000), the Kui (16,000), the Brau with their sub-groups the Kravet and the Krung (15,000), the Rhade (or Ede, 15,000), the Jarai (15,000), the Tampuan (13,500) and the Stieng (5,000). The majority of Cambodia’s hill tribes hail from the Mon-Khmer speaking group of the Austro-Asiatic language family, of which three distinct ethno-linguistic branches are represented: the Bahnaric language branch of north eastern Cambodia, the Katuic language branch of northern and north-central Cambodia and the Pearic language branch of western and south-westerm Cambodia. The traditional homeland of the Bahnaric peoples straddles the border with southern Laos and the central highlands of Vi?t Nam. Ethnicities drawn from this branch and settled in Mondulkiri, Ratanakiri, Stung Treng and eastern Kratie Provinces of Cambodia include the Brau and their sub-groupings the Kravet and Krung (West Bahnaric); the Lamam, Kaco and Tampuan (Central Bahnaric); and the Pnong - including their Kraol sub group - and Stieng (South Bahnaric). The Katuic branch of Mon-Khmer is represented in Cambodia by the Kui of Preah Vihear and northern Kompong Thom Provinces. Ethnicities belonging to the Pearic branch of Mon-Khmer include the Pear of Kompong Thom, the Samre of coastal Koh Kong Province, the Saoch of the coastal Kampot Province, the Somray of northern Pursat and southern Battambang Provinces and the Suoy of Kompong Speu, Kompong Chhnang and eastern Pursat Provinces. The Pearic language branch is believed to represent the ancient population of western Cambodia, and still had many speakers in Angkor city when Chinese traveller and writer Zhou Daguan visited the country seven hundred years ago. Today the Pearic languages are on the verge of extinction, with only people over the age of 50 or 60 years remembering when they were used. The closest related language to Pear found outside Cambodia is Chong, which is spoken in Thailand’s Chanthaburi province by some 3,000 speakers, including children. Two hill tribe groups - the Jarai and Rhade (or Ede) of Ratanakiri Province – hail from the Austronesian or Malay-Polynesian language group of the Austro-Thai language family and are linguistically related to Cham, probably representing an expansion of the Old Cham language from the coastal kingdom of Champa into the highlands. Today the great majority of Jarai and Rhade speakers are found on the other side of the border in Vi?t Nam, where they number several hundred thousand and are concentrated in the eponymous Gia Lai Province. The ethnic Cham community of Cambodia no longer has an active tradition of performing arts. In contrast, several Chinese community associations in Cambodia have Lion Dance teams which perform during Lunar New Year and other Chinese festivals. Each of the hill tribes residing within Cambodian borders has its own unique music and dance traditions, which function together with the production of art objects to propitiate the spirits and celebrate the many social milestones in the lives of members of the community. Musical instruments are crafted with great ingenuity from natural materials such as stone, wood, gourd, bamboo, animal horn and reed to accompany a wide range of solo and group songs and dances. In common with their cousins in southern Laos and the central highlands of Vi?t Nam, many groups utilise bronze drums as an integral part of their ritual ceremonies. The Jarai and Rhade (or Ede) in particular are renowned for their indigenous musical instruments, from stringed bronze gongs to the unique k'longput, made of bamboo tubes into which the players force air by clapping their hands. Many of Cambodia’s ethnic minority groups still maintain the services of shamans to intercede on their behalf with the world of the spirits. These perform special ceremonies and trance-dances to the accompaniment of ritual music. Most of Cambodia’s hill tribes have their own dances, which originated largely as a celebration of everyday events and pastimes. Many of these have been adapted for theatre presentation over the past 50 years. The National Theatre Company of Cambodia Folkloric Dance Troupe includes a wide range of these highly-choreographed ethnic minority dances in its repertoire; however, those wishing to see the dances in their original form must travel to the villages. Craft production has long been one of the most important functional aspects of material culture amongst Cambodia’s ethnic groups. Some ethnic crafts are of ritual origin, but most are produced for domestic use. Handwoven textiles were once produced in a great variety of different traditional designs, colours and weaves in this region, but that skill has declined considerably with the increased availability of cheap mass-produced textiles, particularly amongst those communities living in close proximity to the majority Khmer population. 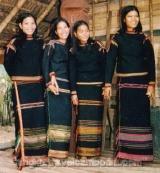 However, in more remote regions both the Malayo-Polynesian speaking Jarai and Rhade (Ede) communities and the Mon-Khmer-speaking Bahnaric peoples (Brau, Lamam, Kaco, Tampuan, Pnong and Stieng) still create their traditional black costumes with elaborate red and gold brocade for festivals and other special occasions. Cambodia's Cham Muslim community still preserves a distinctively Malay style of dress which is worn to the mosque and on special occasions. This usually comprises a long tunic similar to the Malaysian baju panjang, worn in tandem with a silk sarong, also in Malay style. The distinctive Cham headdress known as the kiet is made from spotted cloth patterned with tiny three-dimensional peaks which are created by tying off the fabric tightly with a resist material. As traditional Khmer weaving skills declined amongst the majority Khmer community during the Sangkum Reastr Niyum period of 1955-1970, the Cham themselves became highly proficient in this ancient art and today many of the leading centres for Khmer weaving are still run by ethnic Cham. It is interesting to note that in neighbouring Thailand the late Jim Thompson’s efforts to pioneer the production and promotion of what is now Thai silk were originally initiated in a Cham settlement at Ban Khrua. Basket weaving is prevalent in most hill tribe communities and includes the production of fish traps, mats and containers from all types of natural grasses. 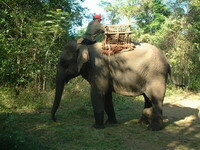 The ubiquitous bamboo basket known as the khapa is woven in various sizes with straps made from rattan and worn on the back to carry products to and from the market. An important feature of both Mon-Khmer and Malay-Polynesian material culture is the creation of elaborately-carved funeral houses decorated with motifs and surrounded by wooden statues or totems, which play an important role in facilitating the passage of the dead to the spirit world. 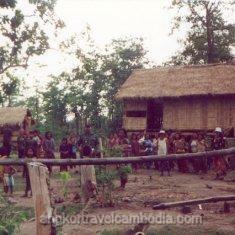 Those of the Jarai, Rhade, Brau, Pnong and Stieng peoples of north east Cambodia are particularly noteworthy. However, woodcarving is more commonly associated with the production of everyday items, including traps (fishpots, pits, cages), spears, bows and arrows, cowbells, tobacco pipes, bowls, spoons, combs and children’s toys. Certain ethnic communities also preserve the art of creating musical instruments such as lutes, fiddles, flutes, reed trumpets, mouth organs and ideophones , which are manufactured from a variety of natural materials including gourd and bamboo. Several ethnicities still utilise bronze gongs in their propitiation ceremonies, though sadly in many areas the art of casting these gongs is dying out. In times gone by bronze gongs were a symbol of wealth and status in many communities, but today an increasing number have been sold to collectors or tourists. Other hilltribe crafts practiced in Cambodia include iron forging (a skill in which the Kui and several of the Bahnaric-speaking peoples were once famous) and a very rudimentary form of pottery. Outside the cities, both ethnic Khmer and ethnic Cham live in villages of 20-150 stilted single-roomed houses with exterior and partition walls made of palm mats or wood, and floors of woven bamboo strips resting on bamboo joists. Located in river valleys or on hillsides in stilted or part-stilted houses of wood and/or bamboo with thatched roofs, the houses of Cambodia’s Pearic communities differ little from this model. Small villages of 20-60 square, mainly single-roomed houses, often clustered around a communal house, can accommodate anything up to 150 families. Traditionally the Bahnaric-speaking Brau, Lamam, Kaco, Tampuan and Stieng peoples, Katuic-speaking Kui peoples and Austronesian or Malay-Polynesian speaking Jarai and Rhade peoples built tall-roofed long houses measuring hundreds of metres in length, which provided living quarters for numerous extended families. Today such long houses have mostly been replaced by smaller, individual dwellings grouped in clusters of between 20 and 100, although some larger houses measuring up to 30 or 40 metres in length with high roofs decorated with wooden sculptures may still be found in remoter Jarai, Rhade and Stieng communities. Traditional houses constructed by the Bahnaric-speaking Pnong community are characterised by their low thatched roofs which reach almost to the ground. Today most Pnong families prefer to live in Khmer-style houses, but it is still common to find additional temporary accommodation being constructed in traditional Pnong style on the family chamka (small vegetable farm). A common feature of many ethnic minority villages is the bamboo spirit gate which marks the boundary of the village. A buffalo-sacrificing ground may often be found nearby. Both Mon-Khmer and Malay-Polynesian ethnic groups are known for their elaborately decorated funeral houses. Surrounded by wooden statues or totems, these play an important role in facilitating the passage of the dead to the spirit world. Ethnic minority literature is oral in nature. The Jarai, Rhade (or Ede) and Pnong in particular preserve a rich corpus of epic poems which have been passed down from generation to generation through the ancient art of sung storytelling. Delivered during festivals and other special occasions by village elders who learned the ancient tales by heart, these poems serve to teach morality as well as to perpetuate the various proverbs, myths, legends and cosmology associated with each ethnic group. Sadly this art form has died out in many areas, but it is still practiced in some remoter villages. Copyright © 2006 ASIA Pacific Travel. All rights reserved.